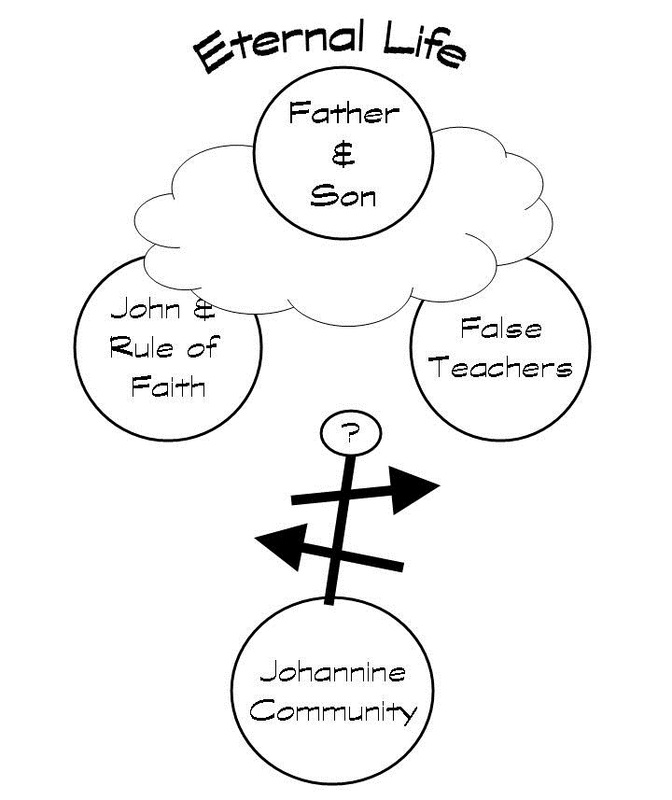 In part 1 (which you might want to read if you haven’t already) I suggested that how we understand the community and false teachers (two of the three groups) addressed in the book shapes which interpretive framework we will use to interpret 1 John. This proposal is based on John’s writing containing a series of tests, which are written out as a comparison of competing claims. One set of claims is made by John (and the apostles). The other set of claims is made by the false teachers. For example, the test for whether a person’s claim to know God is true or false is based on obeying the commandments (2:3-4) and the test for whether a person is abiding in the light is based on loving and hating others (2:9-11). In posing the tests in this way John is asking the community – who do you have more in common with – the apostles (who know God, abide in light etc) or the false teachers (who do not know God, abide in light etc)? Whom you choose to partner (or fellowship) with (1:3-7) through shared beliefs and common practices will speak volumes about you. It will be the basis on which you may know whether you are saved (Test of Life) or mature (Test of Fellowship). This idea of asking the community to choose who they are partnering with draws some support from 2 John 1:7,10-11 as well. Here John warns the community not to partner with the same false teachers. If both the community that John writes to and the false teachers whom he refutes are both considered reborn and in possession of eternal life then the Test of Fellowship framework, which evaluates our spiritual walk and maturity, fits the book. However, if John assumes that the false teachers are unsaved and writes to encourage the community, whom are saved but struggling with assurance because of the counter claims of the false teachers, then the Test of Life view, which evaluates whether we have eternal life or not, is a better framework. So to conclude that post we must answer the question – what does John say about these false teachers? Are they immature saved people who have a weak relationship with God or are they unsaved people who do not possess eternal life? (Of course if you read this post you already know how I answer that question, this post provides some details as to why I answer the way I do). In this post we will look at some of John’s descriptions of the false teachers. They are deniers. One of the passages where John clearly describes the teachers that left the community is 2:18-26. In this passage he labels them antichrists. John goes on to define an antichrist as anyone who denies that Jesus is the Christ (2:22; 4:3). They are liars. The false teachers make numerous claims that John rejects. In rejecting their claims John calls them liars three times. What are they lying about? Having fellowship with God (1:6), knowing God (2:4), and loving God (4:20). Twice John says that they make God out to be a liar because they reject what He has said. What specifically are they rejecting? That all have sinned (1:10) and that eternal life is found in Jesus who is the Christ (5:10-12). It seems clear (to me) that John has no confidence that the false teachers possess eternal life. Since the tests compare the claims of John against the claims of these false teachers it seems most probable that the purpose that guides everything that John is writing is aimed at helping the people in the community gain assurance that they have eternal life (5:13) and not to assess their maturity. Using this framework presents challenges to us as readers. Some of the biggest voiced in class are – how much sin does it take before I am considered ‘practicing sin’ or ‘walking in darkness’ and thus not really saved? With tests as subjective as these how can I ever have assurance? Won’t using the Test of Life framework cause more people to doubt they are saved. Fair questions. However, the same problems exist when using the tests to measure maturity. How much sin does it take before I am considered ‘practicing sin’ or ‘walking in darkness’ and thus an immature Christian who is not walking close to God? With tests as subjective as these how can I ever know if I have a strong relationship with God? Despite concerns that the Test of Life framework may increase people’s doubts, we can’t ignore the context of the writing. Nor should we dismiss the fact that John wrote this book so that he could encourage people and give them a basis for having assurance. If our doubts our increasing as we read this book the problem may not be our framework. It may be us. How do you assess the teachers? Do you think that John is calling his community to work through this writing and assess who they have more in common with? This entry was posted in Theology and tagged 1 John, assurance, faith by MikeB (@AnAgileJedi). Bookmark the permalink.